Need Gutter Cleaning in the Darwin area?Jim's Mowing offers Gutter Cleaning services in Darwin and would be delighted to help. We even offer same day gutter cleans if our scheduled permits. Just call Jim's Gutter Cleaning in Darwin on 1300 191 565 or you can book a gutter cleaning job online for a time that suits to get your gutters cleaned, or schedule a free, no obligation quote. 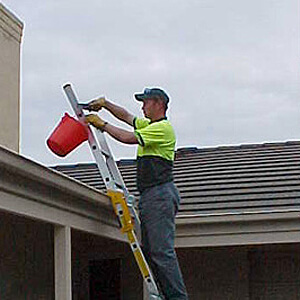 So don't risk your health and safety by climbing up a ladder yourself to clean gutters. We are sure you have better ways to enjoy your free time. Our fully trained gutter cleaning team have all the equipment and know how to clean your gutters safely and efficiently. Call Jim's Gutter Cleaning Services in Darwin on 1300 191 565 now or Book a Jim's Gutter Clean online, today. Your gutters will be expertly cleaned, all leaves and rubbish removed giving you more time to enjoy yourself! So call Jim's Gardening now on 1300 191 565.